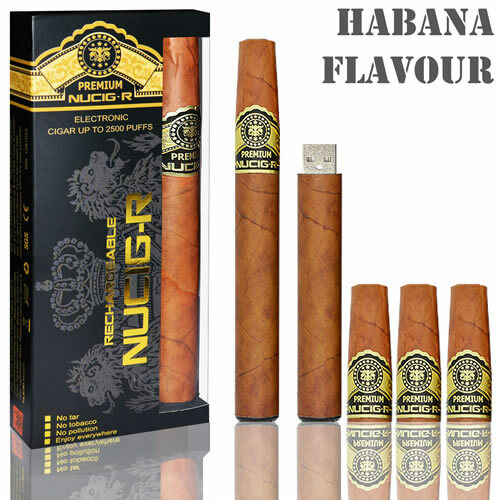 The 'Havana' NUCIG-R is USB rechargeable and really amazing. Not only does it last for the equivalent of 250 cigarettes (2500 inhalations) but our unique 'Habana' flavour tastes like a high quality 'Havana' Cigar from Cuba. Cartridge upto 800 draws ea. Pleasantly surprised at how effective these are. Filters last a very long time and all in all very fairly priced - much cheaper than real ones!! Habana Rechargeable Cigar - recd as a present and pleasantly surprised at how really good it. Saving a fortune compared to my old real cigars and in my opinion just as good and far better health wise. perfectly packed and fast delivrey within 24 hrs. Fantastic service and great products. Have ordered these before and can thoroughly recommend. Good product - good smoke. Filters are super easy to change when a new one is required with plenty of flavour options. I advise buying replacement filters in the larger packs as it is far cheaper.